The submarine's name and hull number will be direct embroidered over the top. Submarine caps are embroidered with Silver Dolphins for Enlisted or Gold Dolphins for Officers. 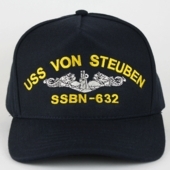 All cap designs adhere to the same traditional U.S. Navy design that's still in use today. Why do we ask for enlisted/officer and years of service? Some badges, insignia, ship silhouettes, etc. have coloring or design that varies depending on the years of service or whether a veteran was enlisted or an officer. We strive for accuracy in our custom hats so we ask these questions to ensure the finished product best represents your service while upholding military traditions. Below is a partial list of hats we have made before.